** COLOR TOUCH RADIO **$2,800 CONVENIENCE AND LIGHTING PACKAGE**DUAL MODE EXHAUST**, Body-Color Outside Heated Power-Adjustable Mirrors, Convenience & Lighting Package, Dual Mode Performance Exhaust, Enhanced Driver Information Center, Head-Up Display, Heated Steering Wheel, High-Intensity Discharge Headlamps, Illuminated Sill Plates, Interior Spectrum Lighting, LED Taillamps, Memory Package, Preferred Equipment Group 2LT, Rear Cross-Traffic Alert, Rear Park Assist, RS Package, Side Blind Zone Alert w/Lane Change Alert, Wheels: 20"" 5-Split Spoke Machined-Face Aluminum, Wireless Charging For Devices. Additional Equipment: Hot Wheels Edition / Includes (g16) Crush Exterior Color, (huz) Jet Black Front Leather-trimmed Seats With Orange Inserts And Accent Stitching, (5vm) Satin Graphite Ground Effects Package, Lpo, (5k9/57v) 20" Satin Graphite Machined-face Wheels, Hot Wheels 50th Anniversary Fender Badge, Unique Grille With Galvano Chrome Inserts, Black Chevrolet Bowtie Emblem, (j6l) Orange-painted Calipers, Illuminated Door Sill Plate With Hot Wheels Anniversary Badge, Premium Carpeted Floor Mats With Orange Stitching And Ghost Stripes, Orange Knee Bolsters And Seat Belts, (n26) Sueded Microfiber-wrapped Flat-bottom Steering Wheel With Orange, (also Includes (wrs) Rs Package, (sht) Satin Graphite Ground Effects Package, Lpo, (5v5) Body-color Wing Spoiler, Lpo And (j55) Brembo 4-piston Front, Performance, 4-wheel Antilock, 4-wheel Disc Brakes. Wheels Rpo Is 5k9. 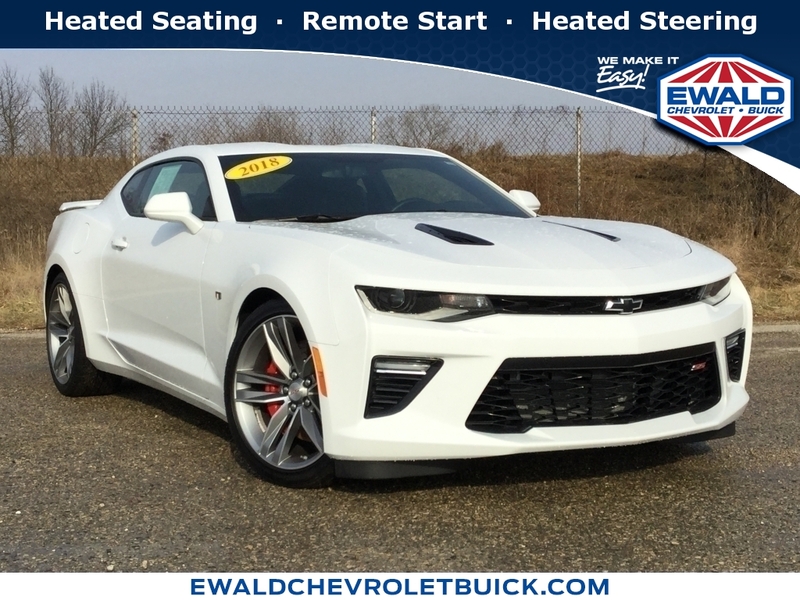 Additional Equipment: V6 1le Track Performance Package / Includes (j55) Brembo 4- Piston Front, Performance, 4-wheel Antilock, 4-wheel Disc Brakes, (kc4) External Engine Oil Cooler, (v03) Extra Capacity Cooling System, (knr) Rear Differential Cooler, (npp) Dual-mode Performance Exhaust, (y4q) Heavy-duty Cooling And Brake Package, (fe3) Performance Suspension, (ftf) Satin Black Front Splitter, (t4f) High Intensity Discharge Headlamps, (dsm) Satin Black Hood Wrap, (d5s) Satin Black Rear Blade Spoiler, (r0f) 245/40zr20 Front And 275/35zr20 Rear, Blackwall, Summer-only, Run-flat Tires, (56z) 20" X 8.5" Front And 20" X 9.5" Rear Black Forged Aluminum Wheels, (n26) Sueded-wrapped, Flat-bottom Steering Wheel And (ks9) Sueded-wrapped Shift Knob, (also Includes (g80) Limited Slip Differential.